during the Monster Energy NASCAR Cup Series 1000Bulbs.com 500 at Talladega Superspeedway on October 14, 2018 in Talladega, Alabama. In the 1000Bulbs.com 500 Monster Energy NASCAR Cup Series race at Talladega (Ala.) Superspeedway on Sunday, there was Stewart-Haas Racing, and then, there was everybody else. 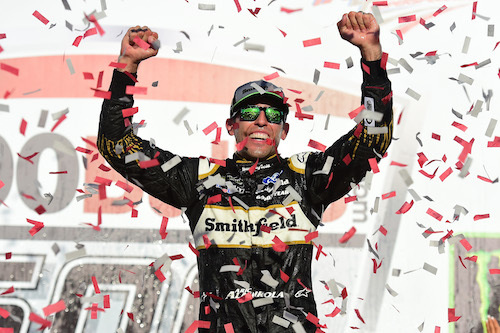 Aric Almirola was the SHR driver who came out on top at Talladega for his second-career win, his first in his first year with Stewart-Haas. With the win, Almirola joined Chase Elliott in already having his playoff third-round berth secured. Clint Bowyer finished second to his teammate. Ricky Stenhouse Jr. was third and Joey Logano fifth to give Ford four positions in the top-five of the finishing order at a track the manufacturer has won the last seven races. 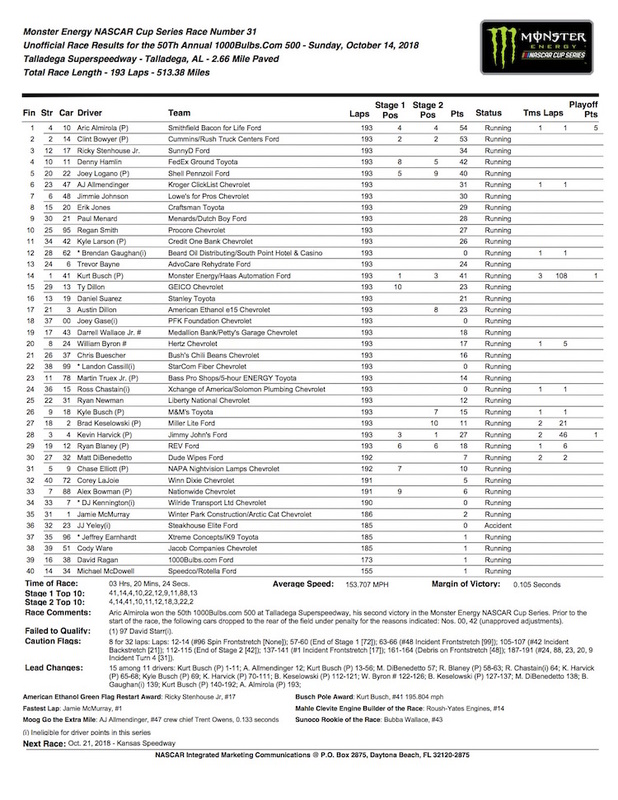 Denny Hamlin was the only non-Ford driver in the top-five in fourth. 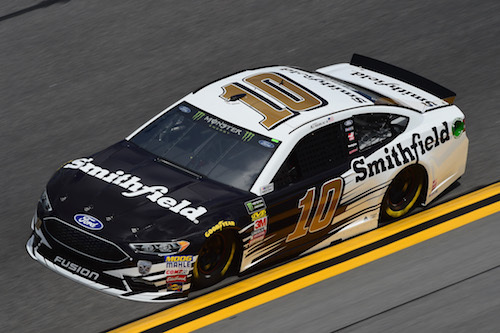 The Stewart-Haas Racing quartet of Almirola, Bowyer, Kurt Busch and Kevin Harvick occupied the top-four positions throughout most of the race after sweeping the top-four spots in Saturday’s qualifying session. Busch led a race-high 108 laps and Harvick 46, but a late-race caution for an incident involving Alex Bowman, J.J. Yeley and William Byron sent the race into overtime as cars ran low on fuel. Harvick had to pit as the green flag waved for the final restart, and Busch ran out of fuel on the last lap. Busch and Harvick were stage winners, with Busch taking the first 55-lap stage and Harvick the second. The wreck that sent the race into overtime was the only caution-causing multi-car crash of the race. There was another wreck on the final lap, though, involving Kyle Busch, Chase Elliott and Ryan Newman. A second multi-car crash came at the finish, involving Kyle Busch, Chase Elliott and Ryan Newman. Aside from cautions at the end of the first two stages and one for a runaway Corey LaJoie tire, other yellow flags were for single-car spins by Jeffrey Earnhardt, Jimmie Johnson, Kyle Larson and Jamie McMurray. Almirola, Bowyer and Logano were the only three playoff drivers to finish the race in the top-10. Larson was 11th at the finish. Truex and Kyle Busch battled handling issues throughout the race and finished 23rd and 26th. Brad Keselowski was 27th, Ryan Blaney 29th, Elliott 31st and Bowman 33rd. Finishing the race sixth through 10th were A.J. Allmendinger, Johnson, Erik Jones, Paul Menard and Regan Smith.